An interesting question came up on Saturday night while we were sitting around chatting about Runefang "War". It led to a surprising discovery - that the Printed Rulebook is different from both the PDF rules and the Digital Rulebook. Under "Counter Charge", the hard copy Rulebook has a paragraph starting "Rather than...." Which talks about pivots while counter charging. That whole paragraph is missing from the digital copy and the PDF. 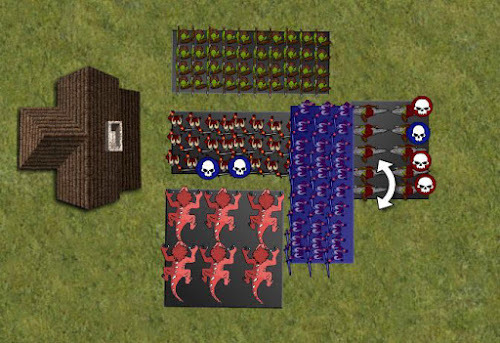 The friendly unit (in the centre with 2 wounds) has a friendly unit of Large Cavalry behind it. It has been charged by the Infantry Horde to the front and a Regiment of cavalry to the side. Can the friendly Horde counter charge the Cavalry Regiment? The section in the para "Rather than...." says that when you pivot you must end your pivot outside the footprint of enemy unit and friendly units. This is in line with the general rule on pivots. 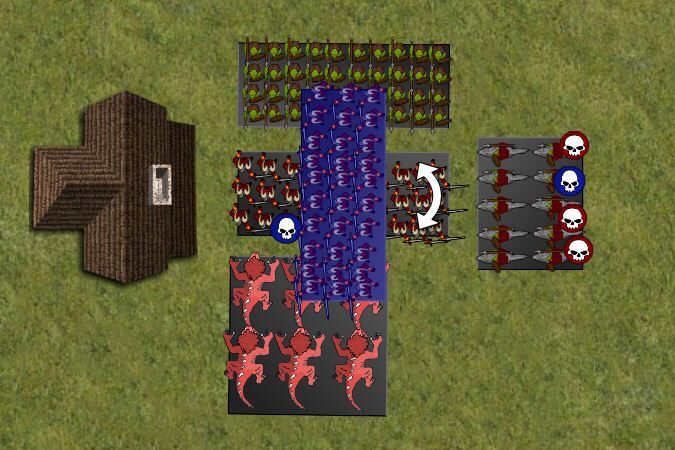 Here you can see that the unit counter charging to its flank needs to pivot through both enemy and friendly units and importantly does not clear them by the end of the pivot. I would say both the general rule and the specific Counter Charge rule say you can't complete the charge. Now remember that the relevant paragraph is missing from digital and PDF copies. The tenor of the discussion was that the third diagram was the situation that both Alessio and the Rules Committee envisaged. I believe that there isn't a problem if the "Rather than..." para is missing - as specific rule overrides general rule - but it is and so there is a specific rule prohibiting the pivot. Over the weekend I confirmed with Daedle of the Rules Committee that the printed Hard Cover Rulebook is the correct version and it hasn't been errataed. So there is a conundrum - we have what I think is a pretty clear rule and we have what the Rules Committee have said on the Mantic Forum was their intention......and importantly how it should be played. Which takes precedence in tournaments? At Runefang opinion was split....certainly those with digital version saw no reason why you couldn't charge to the flank, while those with Hard Cover/Gamer Edition had access to a further rule. Me? Well I'm in the middle somewhere. I think the RC have made their intention clear but it is muddied by the variation in rule sets and that they haven't issued an errata. What's your view? Have at it. Its something I ran into in a game against Kelly a few weeks back. My warrior legion got hit on both flanks & had a unit in front of it at a distance which prevented it from being able to pivot to countercharge. Played it rules as written in the physical book and rued my poor positioning which allowed such a scenario to happen. Pick it up and do it - otherwise you will almost never be able to counter charge flank chargers when also charged in the front. Although I suppose that opens up a new range of tactical ploys (making sure you have something cheap front charging whenever you are landing a meaty flank charge which may not pop the target). Rules committee need an addition to FAQ sharpish, maybe. I'm not Daedle, but even I can read..
Counter-Charging to the flank or rear can sometime prove slightly tricky in narrow confines. It is perfectly fine to slide the unit sideways to fit against the front of the enemy, as long as the final position does not overlap any other unit. 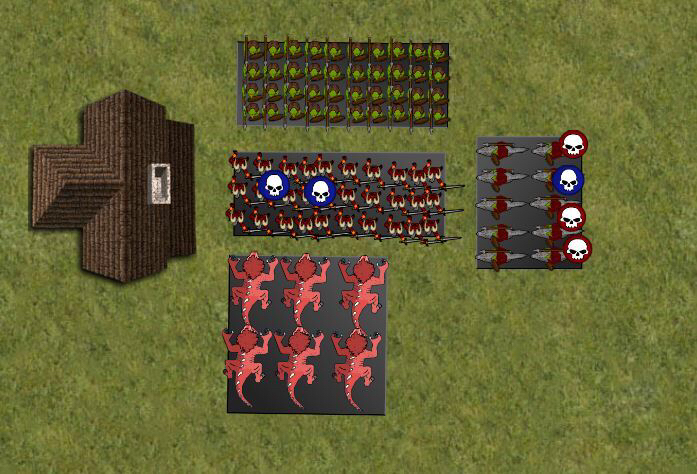 If the unit cannot fit against the target, then it cannot Counter-Charge that unit. Seems rather clear to me. That paragraph quoted does not override the the previous paragraph that quite clearly states at the end of the pivot the unit must not overlap any friendly or enemy units. In addition, the unit is not sliding sideways - it is moving forward. Also, not sure they could counter charge anyway in the example given. The large cav are not centred on the horde. If they were, I'm not sure that the 'victim' horde could fit between the flank of the Large cav and the cav unit. And my work as a courier done. Sorry for multiple postings. Ongoing discussion on Kings of War Fanatics page. Thanks Jonah. I'm not on Facebook group so appreciated. And Mr Faukles is missing the point that there is no reason why FRIENDLY Large Cav would be centred on Horde. I raised that with him. Anyway, i'm trying to tease out how they see it as a legal counter charge. Current suggestions are that slide has a wider interpretation than just side to side once you are facing and have contacted the enemy. If i'm reading what JF is saying correctly the aim is to allow a counter charge if the unit could fit against its intended target, but i'm seeking further clarification. After trying to discuss this on the facebook group, Jon Faulkes said the unit can slide sideways, pivot, then slide sideways again to line up. Nick Williams stated a unit could 'slide freely' and this included forwards. When i put it to him it seemed as long as the unit could end up engaged with its target and clear of other units then how it got there wasn't so important, he agreed with that. The slightly tricky, narrow confines and 'sliding' para seems to be interpreted by them as more important than the 'Rather than' para, seeing as it concludes with the if it can't fit it can't counter charge sentence. Which of course isn't what is written. The RAW seems to prescribe a set pivot, move (both with restrictions) and sideways slide to fit after engaged. The rules committee guys seem to go more with a RAI version. Looking at the counter charge rule further, it states you don't need LOS and can charge a unit in your rear. Following RAW this could only be possible with two 90 degree pivots for rear units, but counter charge is implying some leniency to this. If boxed in a non-flying unit couldn't charge someone in their rear by RAW even with two pivots due to not clearing a unit on the first pivot.